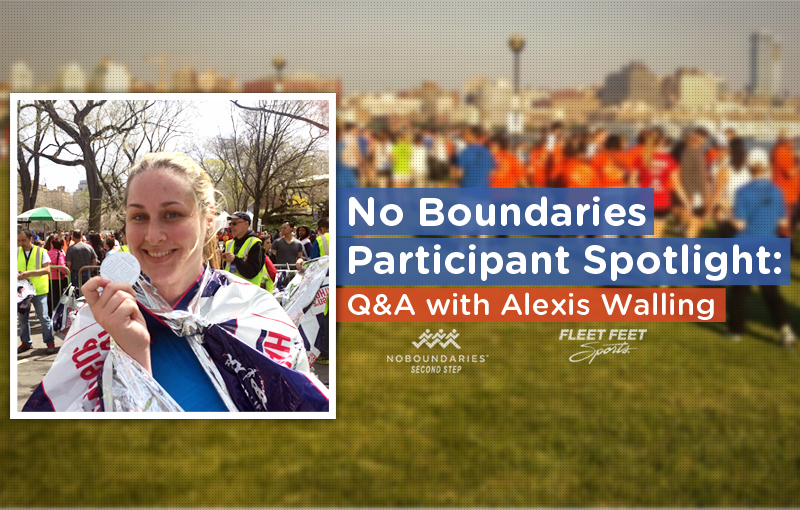 Meet our awesome customer and past No Boundaries participant, Alexis Walling. Alexis shares her motivation for joining Fleet Feet’s 2013 5K Training Program as well as her experience with the program. We’re so proud of her and how far her running has come in the past two years. With the help of No Boundaries, she went from “not being a runner” to training for the NYC 2016 Marathon! It didn’t happen overnight but we’ll let Alexis tell you about her journey in our interview below. Occupation: Speech-Language Pathologist and on the side I am an event planner and co-organize events for the Hoboken Social Sandbox. When did you start running and why? I started running in August of 2013. I never really ran before joining a Fleet Feet program. Growing up I played sports but always hated the running part. What’s your motivation for staying active? My motivation is weight loss. I have lost a good amount of weight staying on a running schedule. I also row at Go-Row studios. Running is also a great stress reliever! When I need to clear my head now I go running and get lost in my music. What’s your favorite thing about running? My favorite thing is that it’s just me. Doesn't matter how fast or slow I am or if I do a run/walk combination. I don't have to compete against anyone but myself. I also find that runners are extremely supportive of each other. I am always worried about how slow I am but no one really cares and everyone just is so encouraging. What training program(s) did you do with Fleet Feet Hoboken? I did the No Boundaries 5K training program for HoBOOken. My friend Mary and I joined together. It was such a great supportive program for beginners! Why did you decide to join the Fleet Feet training group? I did it for exercise and to meet new people. What hurdle are you the proudest of overcoming? I recently ran 2 Half Marathons (Philadelphia and the More/Fitness Women's Half Marathon). It is something I NEVER thought I would do! Running goals for the future? I got into the 2015 NYC Marathon! Yikes! So you will see me out there no matter how long it takes me to finish! I will be running/walking to raise money for Party with Purpose in Hoboken. However, before I hit the streets of NYC I have 2 more Half Marathons (Jersey City and Staten Island). What’s your favorite thing about Fleet Feet or their training groups? What’s your best piece of advice for new runners? The hardest part is just getting started and don't worry about how slow/fast you are or if you have to run/walk because no one else cares! Set aside time and schedule it into your day. I try to remind myself that if I have an hour to watch TV I should have an hour to run. But most of all have fun, laugh, and make friends while you're out there!as slow as can be (I am still slow) but the coaches were right there with me! Has our interview with Alexis inspired you to run a 5K? Registration for our No Boundaries 5K Training Program Summer 2016 is now open. Register by May 5th and receive early bird discount pricing! Training begins May 17th and ends with the Party With Purpose 5K on July 12.